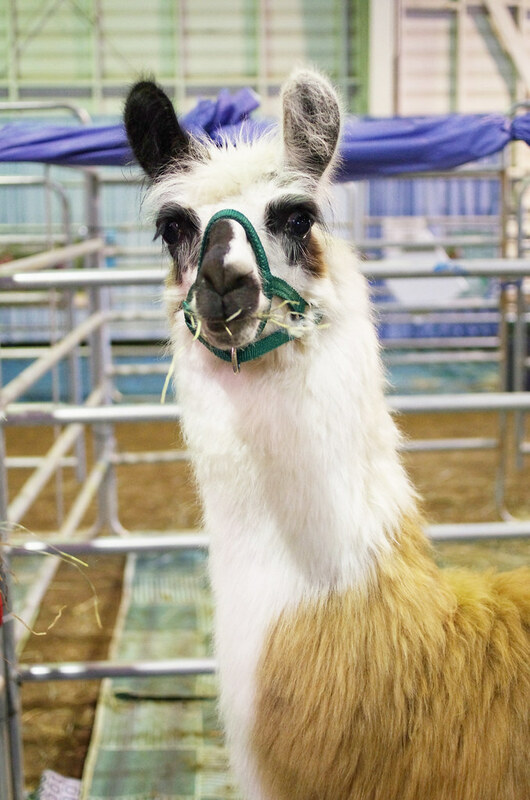 A Yarny Weekend at Oregon Flock & Fiber Festival: Part 1 - Animals! So this last weekend, my awesome friend Rebecca organized a trip for a small group of us to take a trip down to the Oregon Flock & Fiber Festival. I had an amazing time hanging out with my friends - established and new alike! - and meeting some really cool artisans, fiber enthusiasts, and designers. 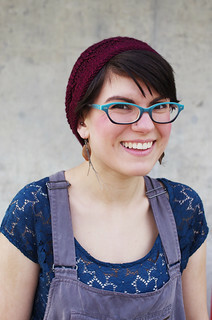 Everyone I met was super gracious, letting me take photos and nerd out about yarn with them. Every time I go to a small, fiber-focused event like this, I am reminded of what a vibrant community this is, and how lucky I feel to be a part of it. First up, I wanted to talk about the animals. It's always nice to be reminded of the origins of my yarn, and to remember that stewardship and sustainability are an integral part of a community like this. 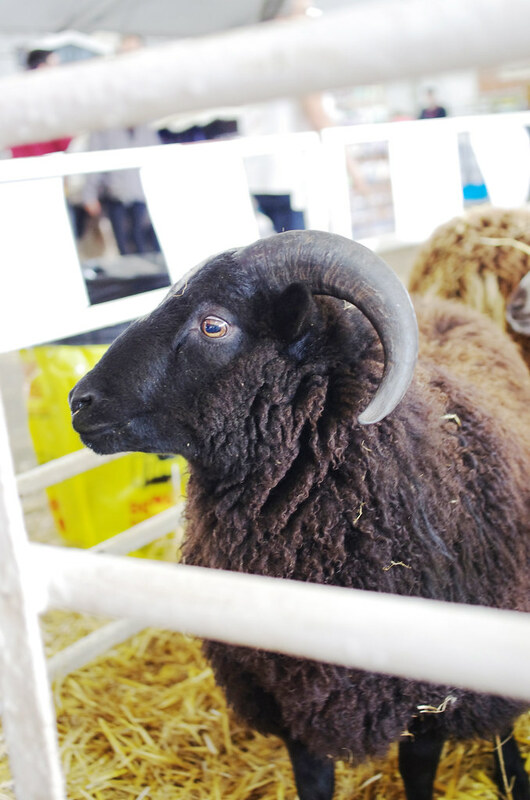 From shepherds and mills, to independent dyers and designers, we are all connected by these animals, and sheep & wool festivals are a great way to experience that connection. 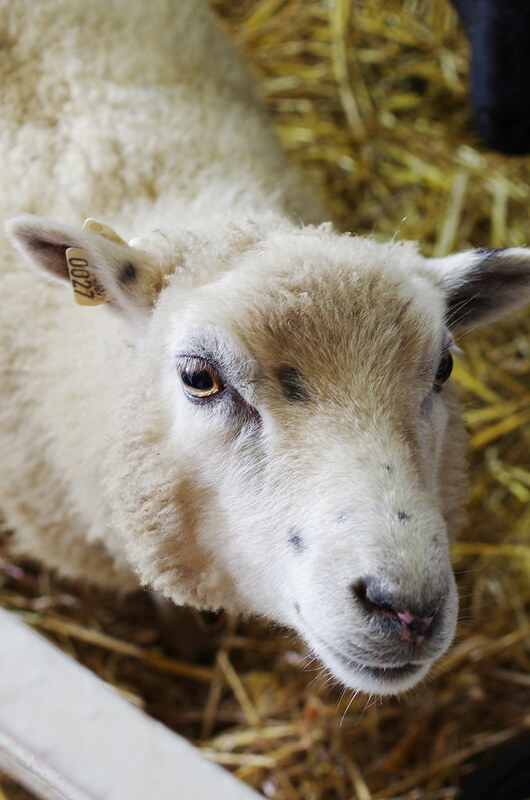 So, after wandering around the market for a bit on Saturday, we went to the barns and met some wooly friends. 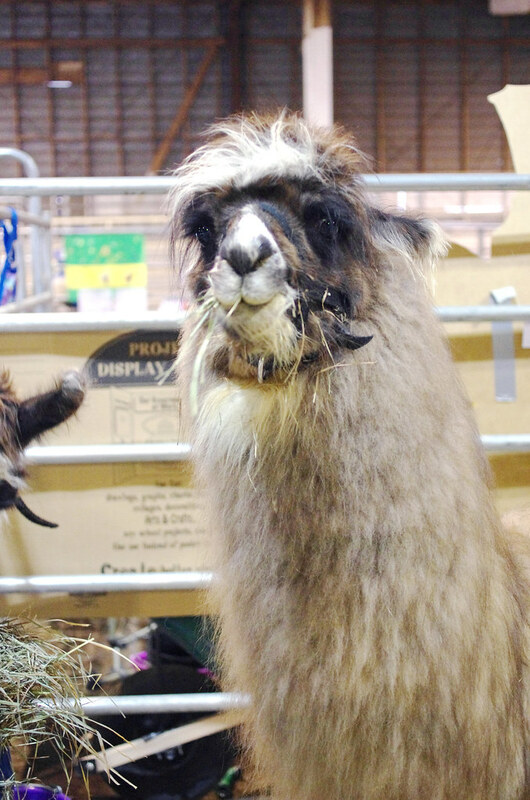 I'd mostly seen alpacas and sheep at sheep & wool festivals before, so I really enjoyed seeing so many llamas. I was really taken by their spunky personalities, and surprised by how beautiful and agile they are. Unshorn llamas are where it's at in the majesty department! 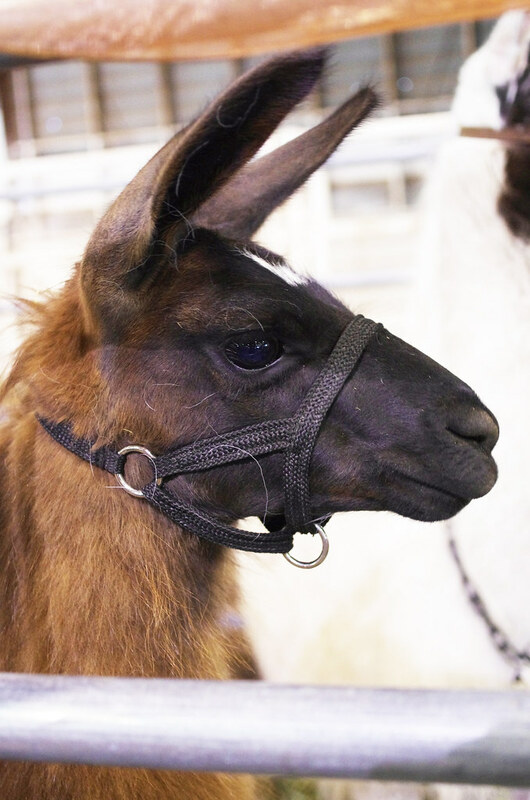 We stayed and watched some llamas walk an obstacle course with their trainers, which really demonstrated how different each animal's personality and strengths were. They were super photogenic, too: they would stand there and mug for the camera for minutes at a time. I love photographing animals, but most are so active that it can be tricky to get shots in focus. Not so with llamas: they'd grab some hay and then chew and stare into my camera lens deeply and soulfully until I had plenty of shots. I'm sure they'd be masters of the selfie. 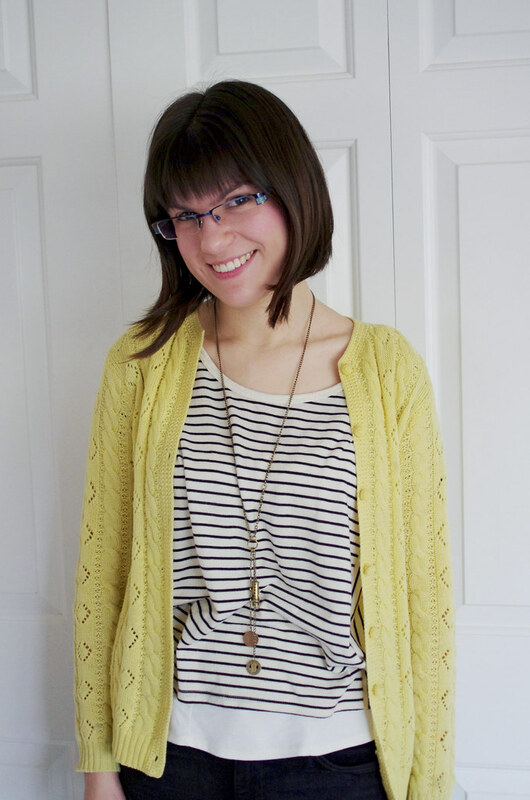 Stay tuned - I'll be talking about yarn people and vendor highlights in the coming week! 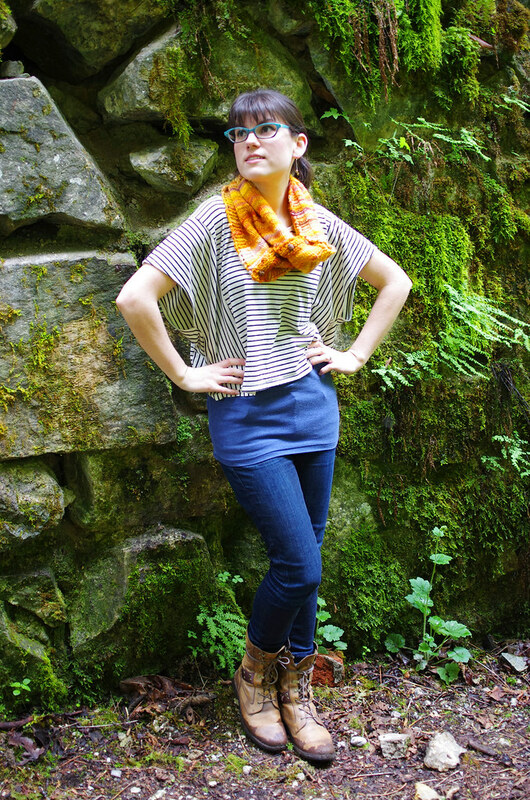 I've had it in my brain for the last few months that I really wanted to garment duplicate my favorite striped tee: it's a great layering piece, it goes with almost everything, and it's comfortable without looking sloppy. It was also thrifted, has no tags, and is starting to pill, so I'd already started thinking about how to replace it in my wardrobe. 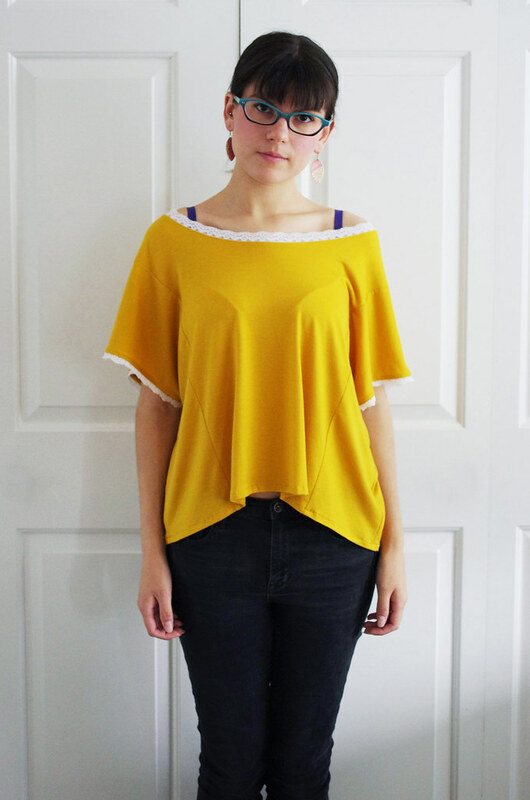 There are a few things I might tweak in my next version, but in the meantime, I'm really happy with my new shirt! It has a '70s sort of vibe, which has totally been my jam for the last six months or so. 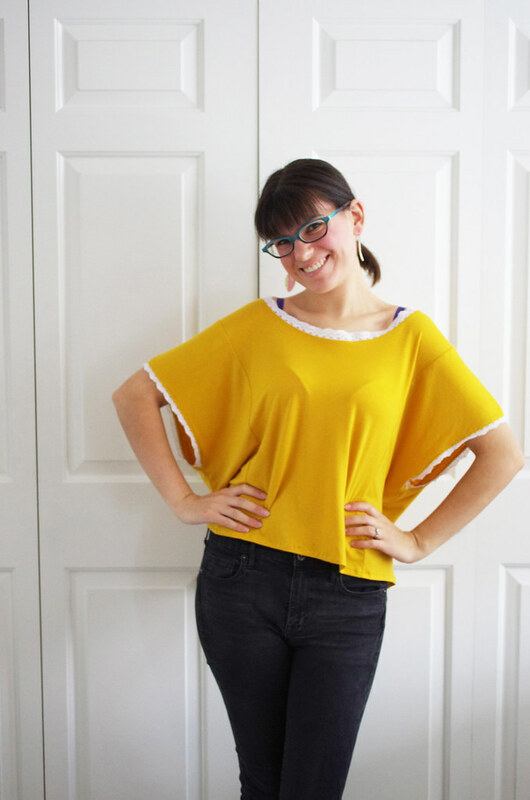 And other than some issues with my serger, this was only a few hours of very easy sewing, for a pretty great result! Doing this little illustration for the title page of my Collection portfolio section has been on my to-do list for a long time - almost a year, actually! Last night, I was feeling restless about all of my other projects, so I grabbed my tracing paper and Copic markers and gave it a go. 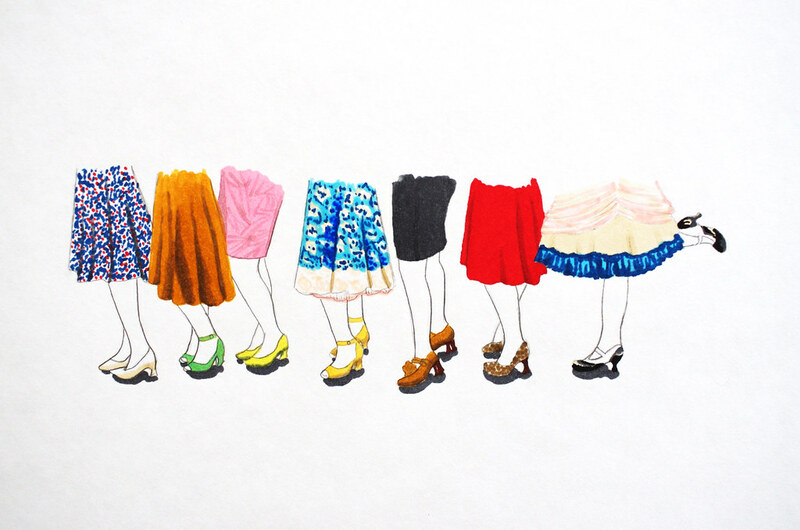 I didn't actually intend to finish it last night, but it was so fun to illustrate the shoe/skirt combinations that I looked up around 1 am and it was done. It's one of the last things I need to do to finish this section of my portfolio, which is one of just three projects left before I graduate. Oh yeah, and all the shoes are Fluevogs. Yeahhhh! 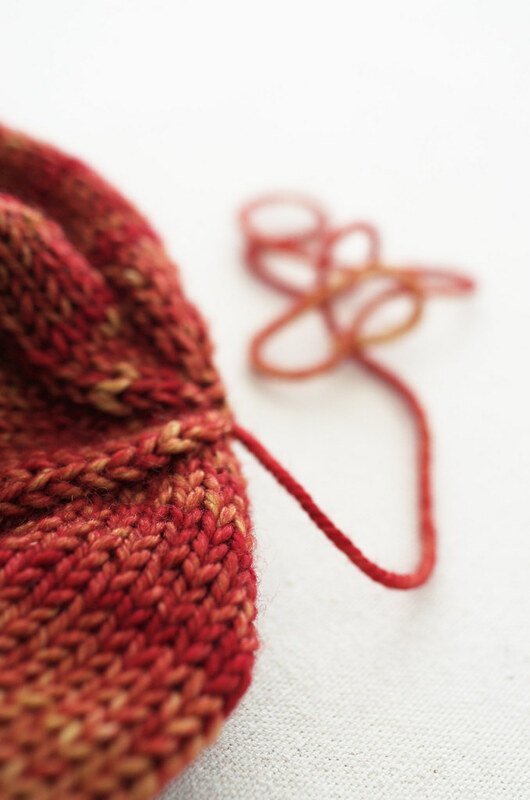 A while ago, we got a shipment of Hazel Knits Cadence at the shop, and I immediately fell in love - it has the lovely, subtly shaded colors of Hazel Knits, but in a squishy worsted weight. As soon as I saw it, I thought of a hat design with a pointed lace detail and nupps. 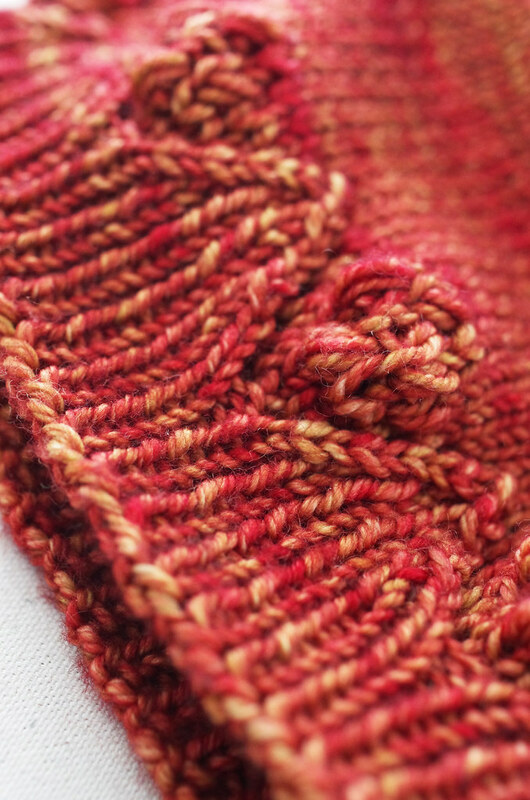 I hemmed and hawed for a few weeks before I finally broke down and got a skein in the colorway Braeburn, a reddish-orange with light green undertones, just like a Braeburn apple! 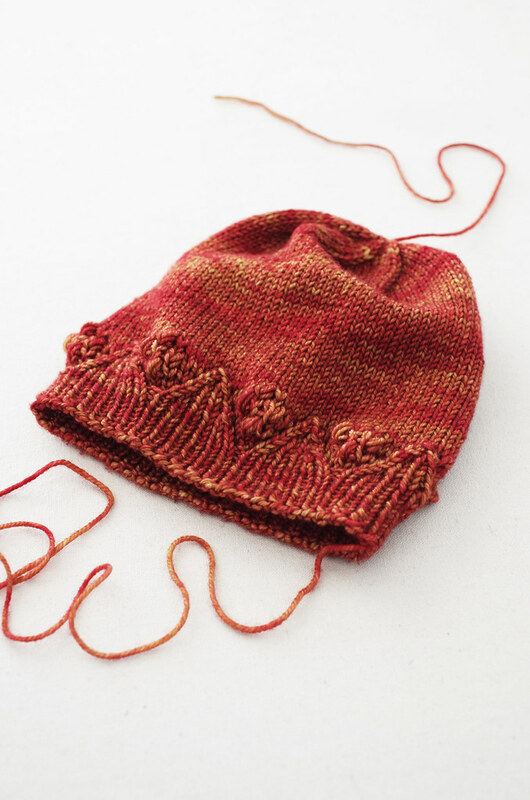 It was barely in my stash a week before I cast on and finished this little hat, which I'm calling Pip. 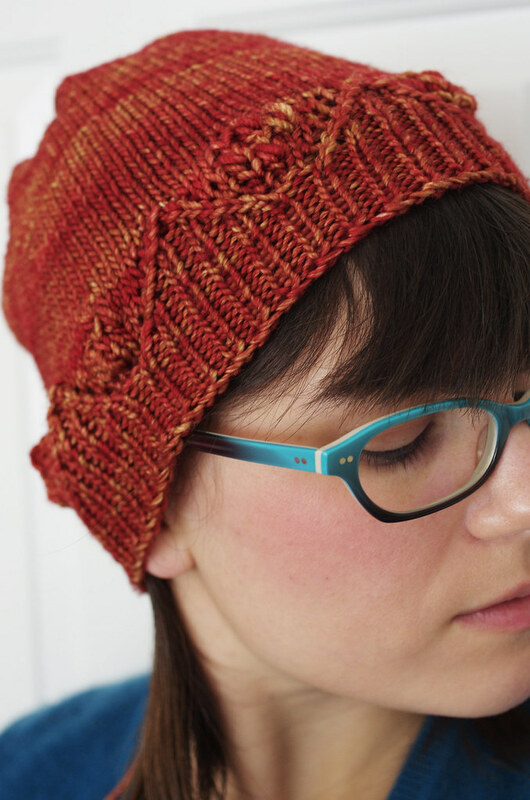 I have tons of other things that I should be working on (and I have a bit of tendinitis in my right wrist that I'm knitting through with a brace, whoops), but this hat was just so easy and fast that I had to get it out of my noggin and... uh... onto my noggin. I just finished a few minutes ago, and Pip is already taking a dip so I can block her. Hooray, hooray! Houston, we have fronts! 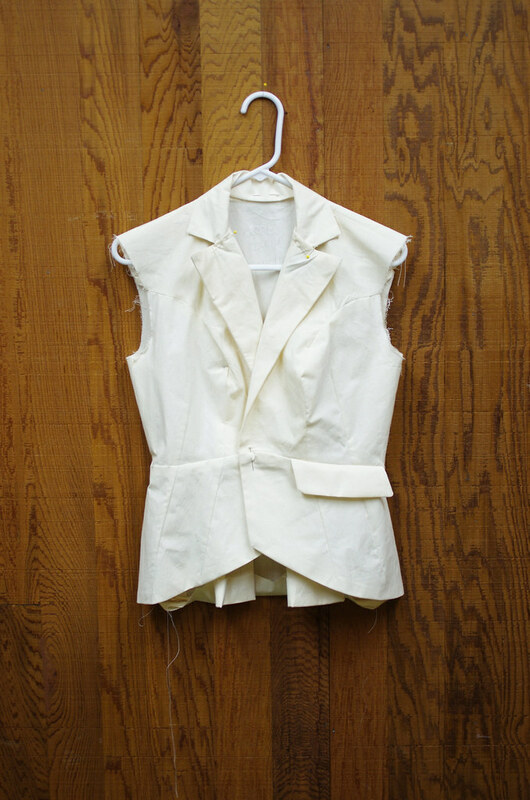 On Monday, I went out to my tailoring teacher's house to work on my jacket. 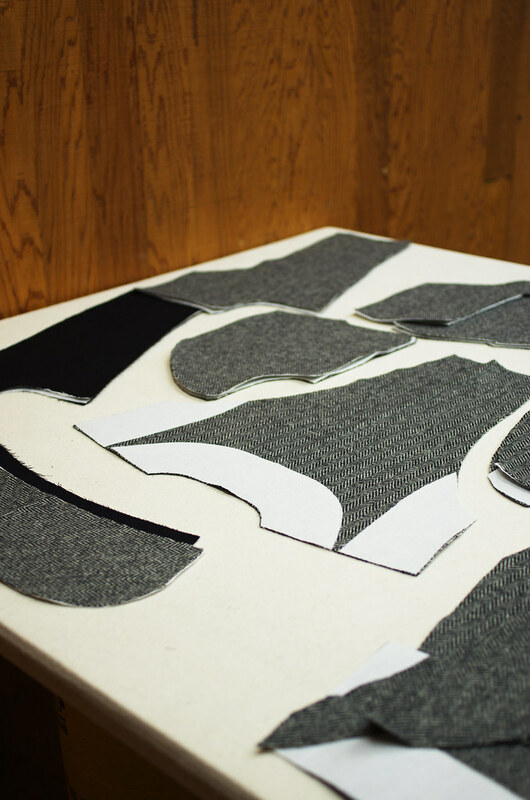 I was there for about five hours, and in that time, I pressed everything, put together the back of the jacket, and built the front of the jacket, including in-seam pockets with a contrast flap. The process was slow, but really wonderful and precise, thanks to my teacher's patient guidance and amazing iron. 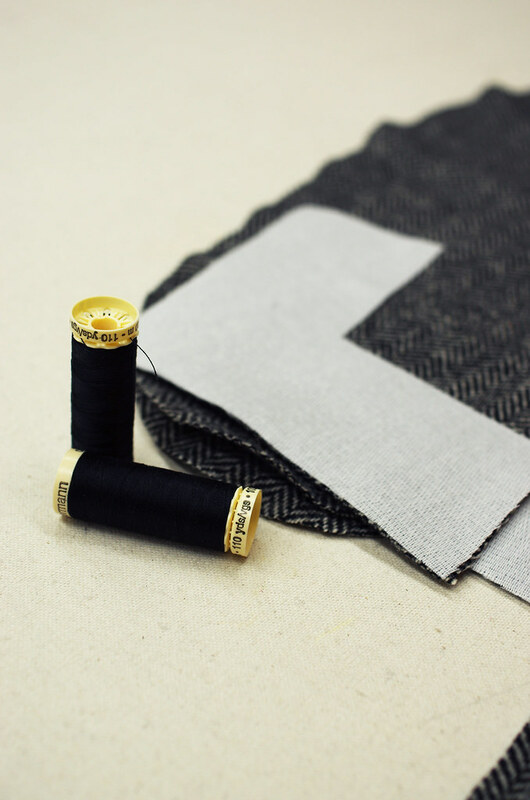 I had always heard about how pliable wool is for tailoring, but I had never experienced it with the level of iron that I had been working with. Spitting and inconsistent steam are a constant problem with most irons I've worked with - that, and for some reason, I'm totally allergic to the concept of using a press cloth. I hate how little control and visibility they add to the equation, so I weasel out of using one whenever possible. I always thought that meant I'm just a bad, lazy sewist. 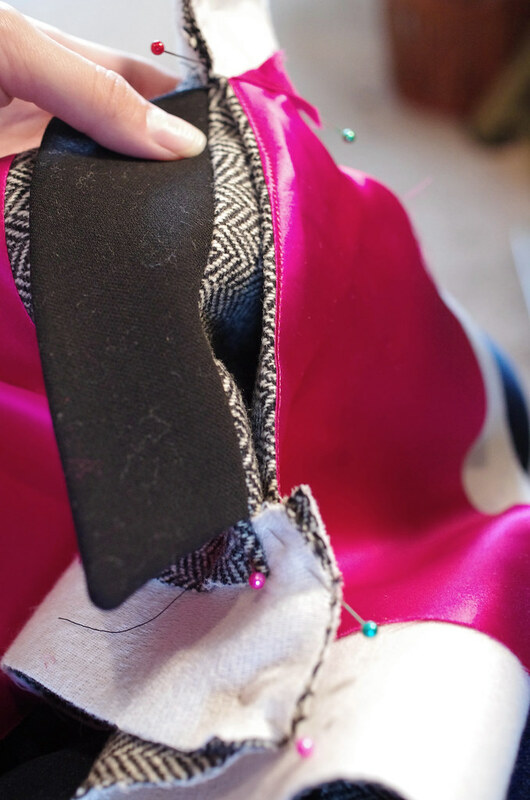 So imagine my delight when I pressed my first seam open with my teacher's iron - no press cloth required because of the coating on the soleplate, hallelujah - and the ripply, thick seam gently opened and flattened with a generous burst of steam and a little bit of elbow grease. Seriously, it was magic. Her iron had a detached boiler, maintained a consistent temperature, and let out concentrated gusts of steam by pushing a big orange button on the side of the iron. (It was also heavy: by the end of the day, my wrists were definitely aching.) 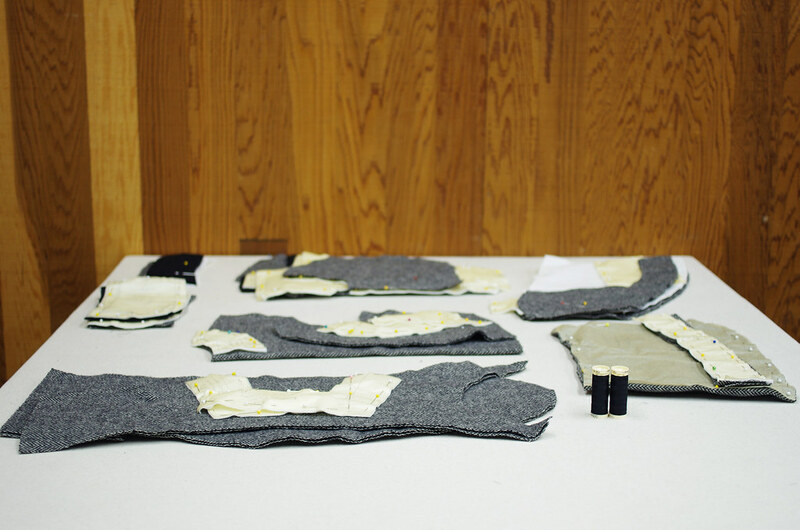 Between pressing and physically whacking thick areas with a clapper, my seams ended up practically melting together on the front of the jacket. Like buttah. 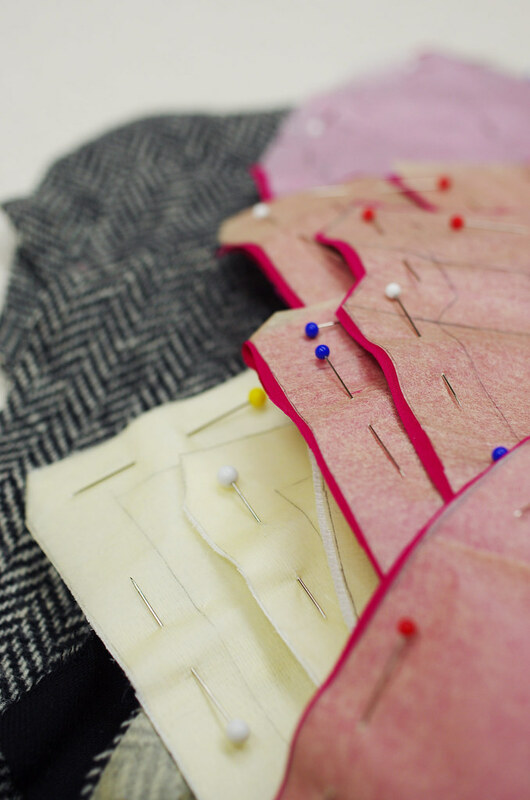 I already knew I liked tailoring from taking the techniques class, even with boring cotton muslin - but this was a whole different (complex, exacting, wooly, crisp) story. And I think I'm in love. Years ago, when I was a very new sock knitter - and very new knitter in general - I knit Nancy Bush's Anniversary Socks from Favorite Socks. It was during an intensive monthlong EMT class, and I knit them during early morning lectures to keep myself focused when coffee wasn't quite enough. 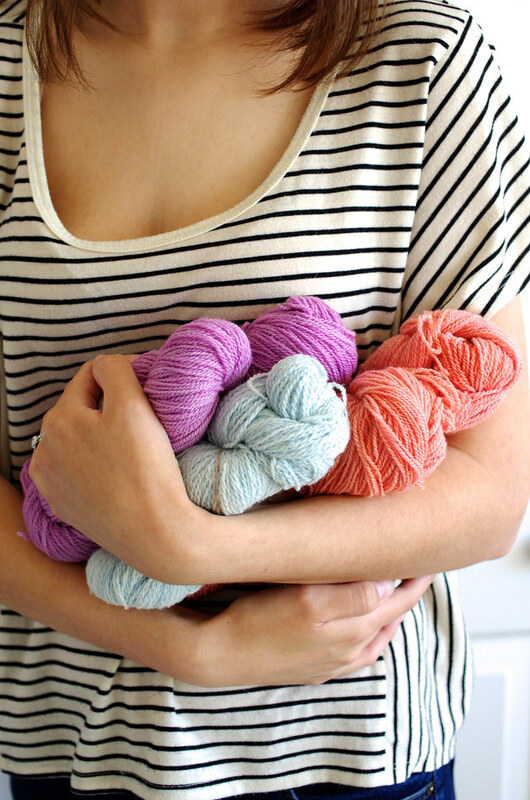 I remember thinking while I was knitting them that they were the most beautiful, delicate thing I had ever made, and I was secretly very proud every time I stopped at the end of a round to look at them. 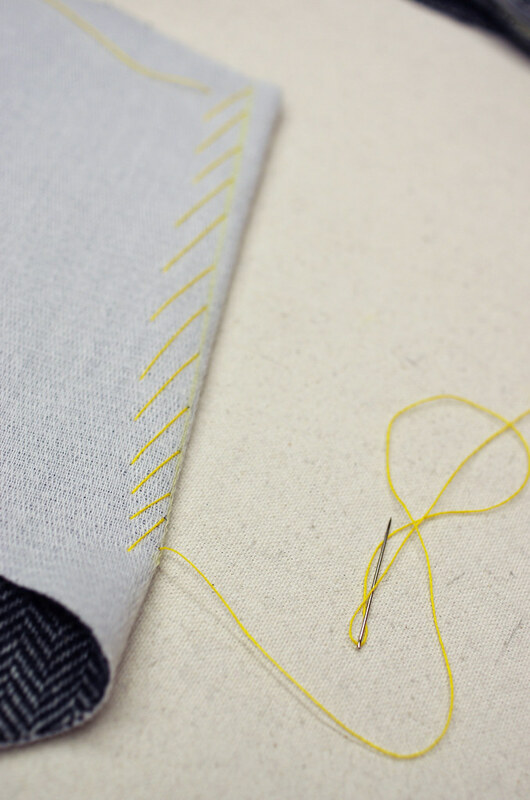 Even in the years since then, I've never forgotten that feeling: the magic of making fabric on tiny needles with tiny yarn; those little holes and twists producing something even more lovely than the sum of their parts. 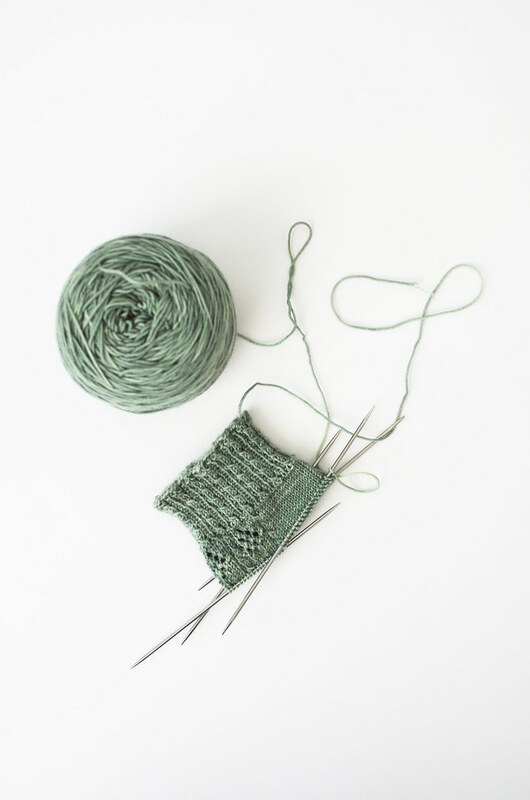 And even though I moved on to different projects and my sock knitting lessened for several years, I still thought of those socks sometimes. And then thinking of them turned into a plan to knit them again. And then I picked out a yarn from my stash that I thought would work. 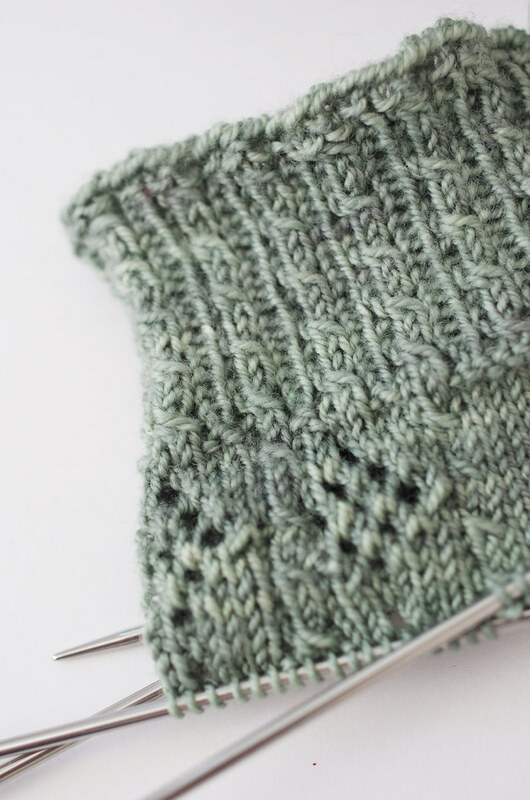 So the other day, I finished my Waving Lace socks and immediately wanted to knit another sock, so I went upstairs and grabbed that Ella Rae Lace Merino that I made those grand plans for, and I cast on. And everything about it was just as lovely as I remembered. For me, construction always happens in a funny sort of time warp. No matter your best laid plans and fondest wishes, the garment will act like a petulant toddler during certain tasks that should be easy. And, equally perplexing, things that are obnoxious in other materials will sail along happily, nary a problem in sight. The aforementioned dart problem! 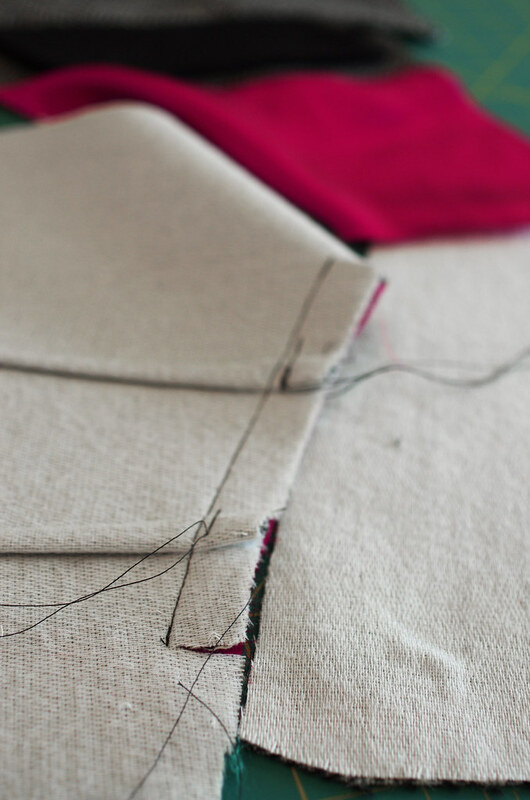 I was finding that the bulkiness of the interfaced fabric was interfering with pinning and sewing the darts in, so I ended up getting some topstitching thread and hand-basting the darts in to prevent the fabric from shifting underneath the machine. 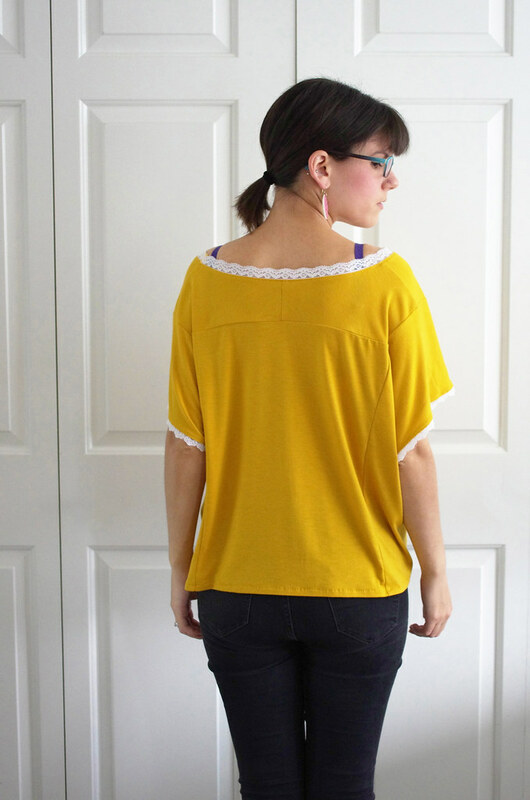 It didn't take very long, and it flattened out a lot of the bulk and made all of my darts sew in perfectly. Awwww yeah. 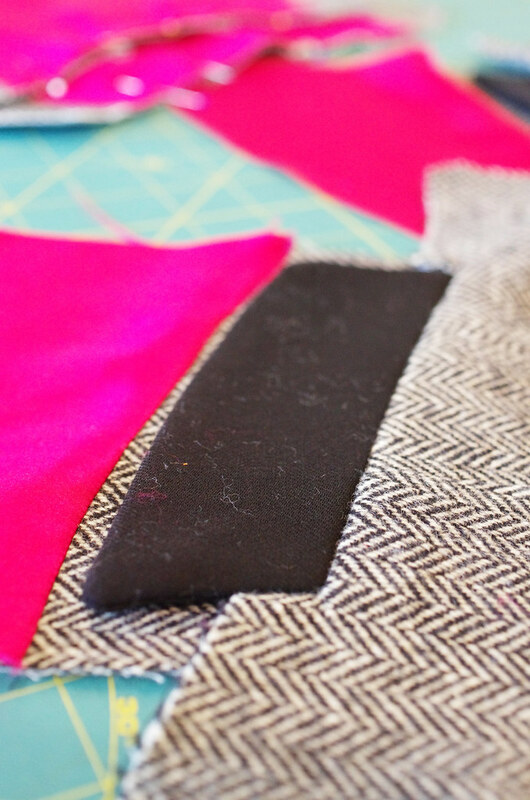 Also note the ridiculous pattern matching I did when I cut the undercollar. I had forgotten about it until today, when I went to fuse the pieces and was pleasantly surprised - they're both cut on the bias, but I arranged and cut them separately so that they're exact mirrors of each other. High five, past self! 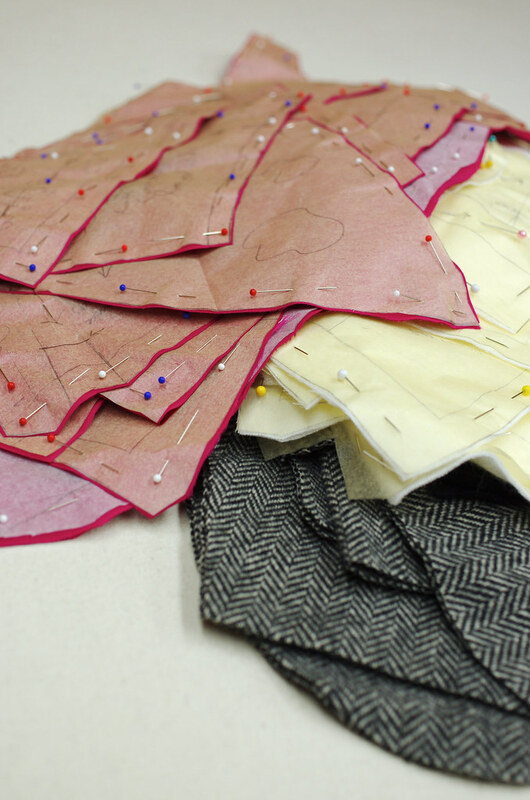 And this is what I ended up with: two bodice fronts, two front peplums, a back peplum, and a bodice back. 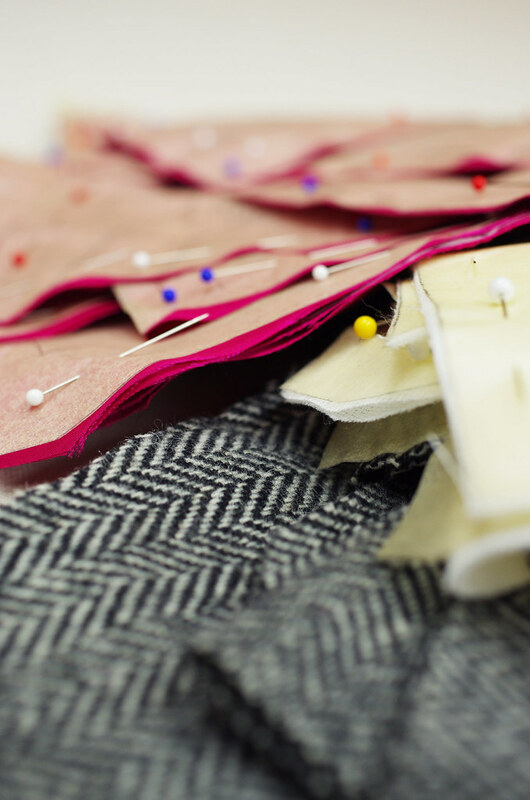 I'm going to be doing a full day of jacket with our tailoring teacher on Monday, so I'm trying to get as much done as possible before then. 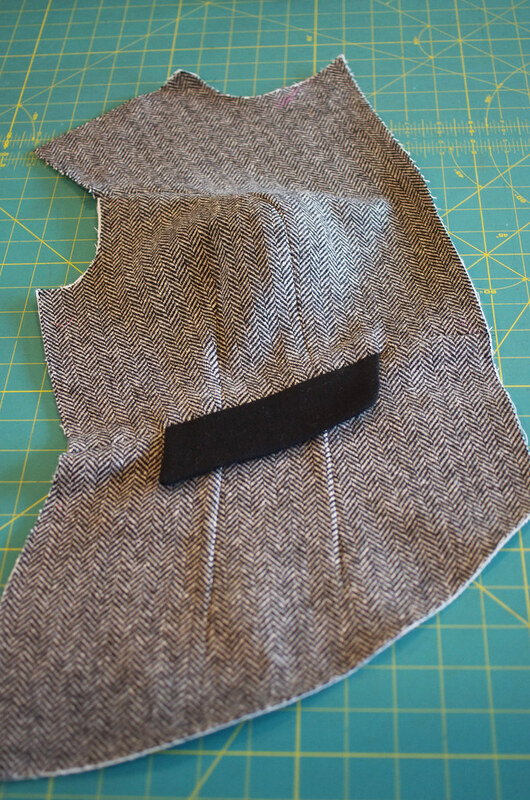 I'm hoping to get a bit of my lining constructed this weekend too, but we'll see how that goes. 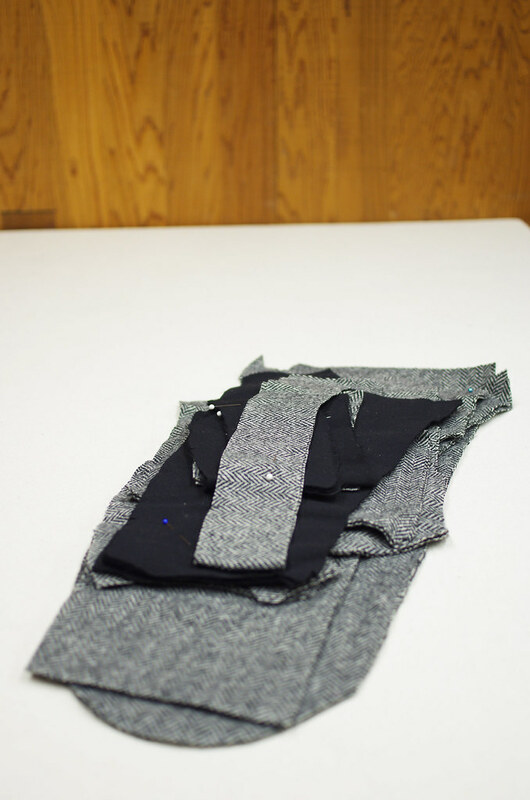 As for that vortex: I thought I was going to get everything cut out and fused, and the darts, tucks, and princess lines sewn - all in about five hours or so. Instead, it's been about 10 hours of work over two different days. Hah! Hah! Time flies when you're deeply out of touch with reality! 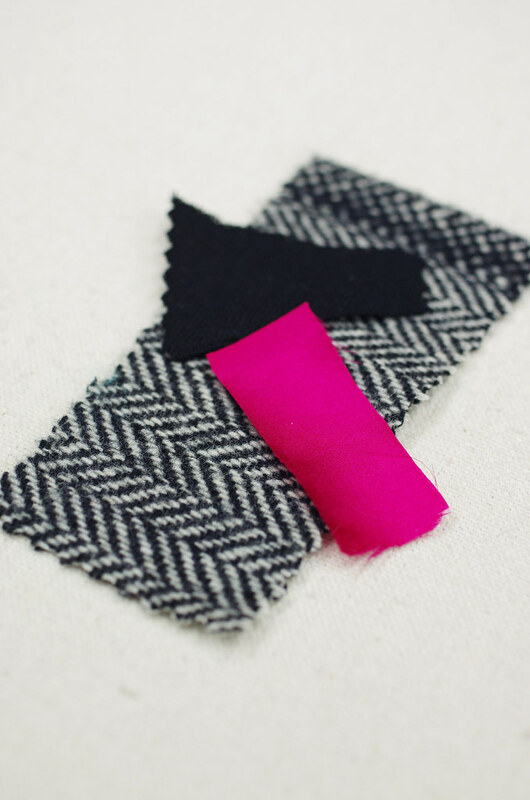 A few months ago, this was the state of my tailored jacket: one finalized muslin; four yards of gorgeous black & white wool herringbone; a yard of squishy black wool twill; four yards of hot pink silk charmeuse. 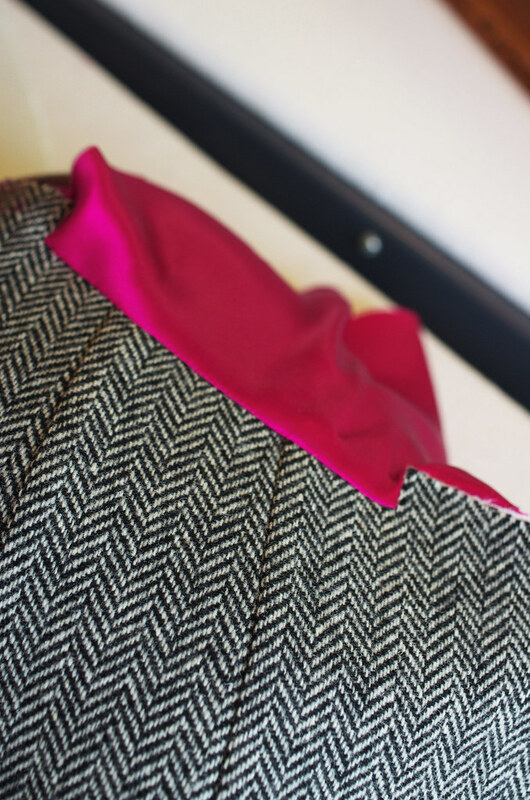 When I decided to put my jacket on hold for ballgown, I tucked it all away for safekeeping - but not before cutting the herringbone and contrast wool for the outside of the jacket. 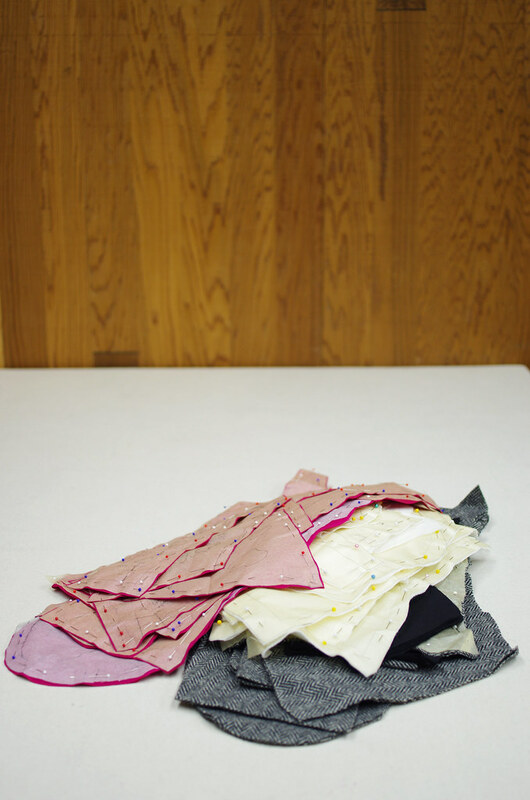 This morning, this little pile was all that existed of my jacket. 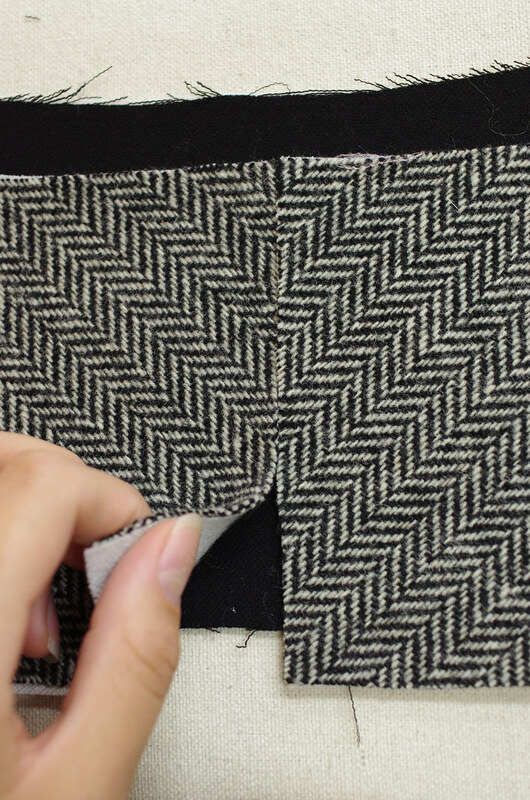 I had the forethought to mark the wrong side of the fabric with pins on every single piece, which was a great plan since this fabric is nearly identical on both sides. So this afternoon, I pressed and smoothed and pinned my interfacing and charmeuse lining, and then I cut out the whole shebang. I even did it in my old ballgown room, which was a little bittersweet. It felt really good to get back to my big projects, and it also felt like visiting an old friend - hello, ceiling stain! Hello, spot where I laid down on the floor and cried the day I felt pukey! Sigh. 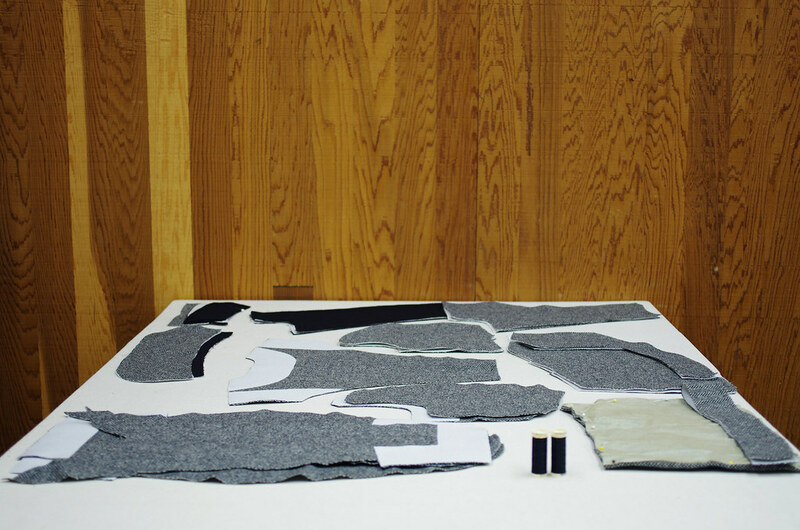 Anyhow, now all the pieces are cut and ready to be put together! Slow progress, but progress nonetheless. This week, Lumberjack is on his two-week vacation before he starts a new job, so we've been doing a major overhaul of our living space and decor. We've been renting our current place for a little over a year, and since we weren't sure how long we were staying, we've been reluctant to put much effort into decorating. In the last few weeks, though, we've decided not to move in the foreseeable future - and that has kicked off an epic reevaluation of our whole house! Through college, I moved at least once a year, if not two or three times; since then, we've moved within the Seattle metropolitan area about once a year. Our current place is the longest I've stayed at an address since I moved out of my parents' house, but up until a few weeks ago, I just assumed we were going to be moving again soon. So, now that we've decided to stay, it opens up a whole new world of possibilities - the most exciting of which is the opportunity to make our space and my intense level of aesthetic neediness coincide. Aesthetic neediness, simply put, is the constant desire to surround oneself - both physically and conceptually - with thoughtful, functional, aesthetically interesting or appealing objects and ideas. Sparklepants came up with the term, and it perfectly sums up the weird, perfectionist scrutiny that is so often employed against the belongings of a design- or art-minded person. 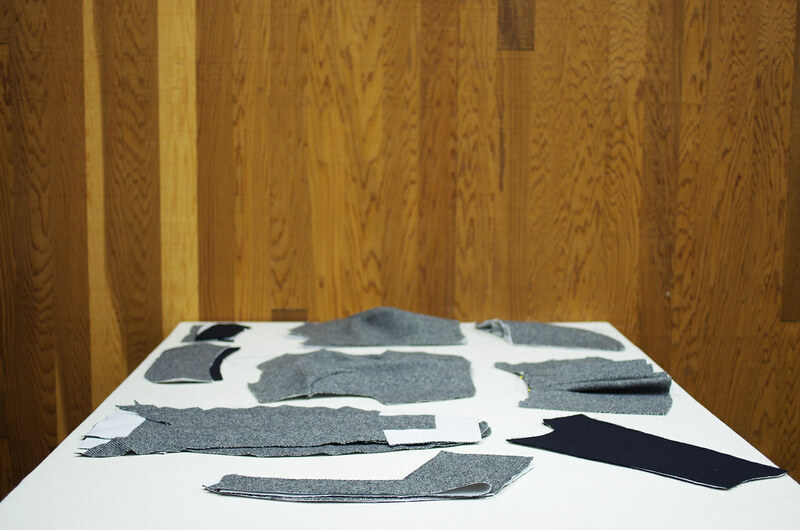 Aesthetic neediness begets Pinterest boards, and breathlessly exuberant design blogs, and minimalist lifestyles. It's critical, and purposeful, and not a small amount snobby - which, honestly, is the part that made me resist it for a long, long time. I have a lot of thoughts about stuff in general, and I also recognize that aesthetic neediness is often closely associated with positions of privilege and power. And although I deeply appreciate the things that I consciously choose for the value and beauty they bring to my life, I try to keep in mind that my concept and execution of aesthetic neediness is a personal decision that neither reflects nor dictates others' experiences of their own space and belongings. Oof. 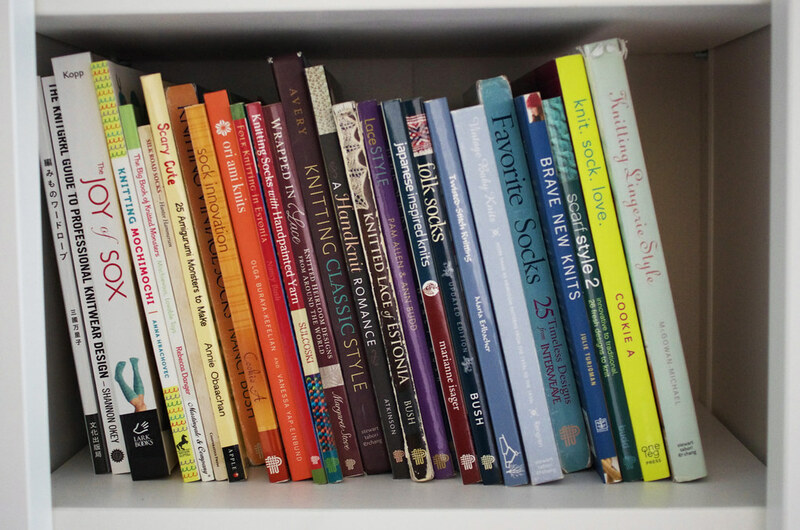 Anyhow, the whole point of that is, after many years of dissatisfaction with my bookshelf, I finally transferred all of my knitting, fashion, and inspiration books to their own shelf. And then I organized each shelf by color, like the obnoxious hipster I am. For years, I organized my books by title or content, and I've finally realized that for these books, they are not meant to be searchable so much as they are meant to be beautiful and inspiring - and it's okay if they reflect that! So now, all of my books are on the same bookcase; the bookcase is pretty and bright; I still have a sense of where each of them are; and they are arranged in a pretty rainbow that makes my aesthetically needy little self very, very happy.